Since stumbling across American manufacturer Tekton Design, I've been on a bit of a Made-in-the-USA kick, but not because I feel that a product made in the U.S. is automatically better than those made in Canada or China. I'm interested in American manufacturing companies, because we always hear about how companies must outsource their wares overseas in order to save money. Tekton Design disproves that theory, as its product costs less than those of many Asian competitors. It's not alone, either; Magnepan, Zu Audio, RBH and others have competitive products at virtually every price point. I recently spent some time with another American-made product in the form of Triad's InRoom Gold LCR loudspeaker, which I'd like to tell you about. 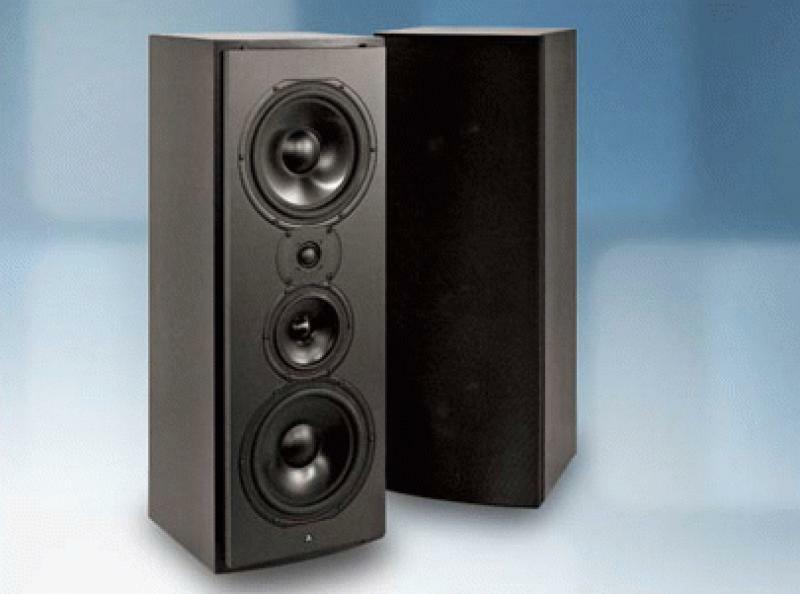 • Read more floorstanding speaker reviews from the staff at HomeTheaterReview.com. • Explore subwoofers in our Subwoofer Review section. 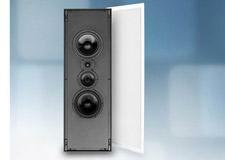 • See more reviews in our In-Wall Speaker Review section. I know Triad is not a new company to the audiophile and home theater space, but until recently, I knew of them in name only. Truth is, Triad has been Made in America before such a thing became in vogue. Suffice to say, the company has always made its loudspeakers in America, using American labor and materials. The InRoom Gold LCR (Gold) reviewed here is among one of Triad's higher-end offerings, though the retail price of $2,150 each seems rather reasonable after listening to a pair of them for an afternoon. The Gold is a three-way loudspeaker, featuring proprietary drivers that are housed in a rather inert albeit basic rectangular cabinet. 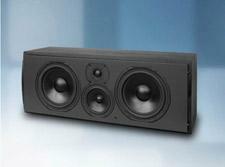 The speaker itself measures 10.75 inches wide by 29 inches tall and nearly 11 inches deep, making it one substantial bookshelf or monitor loudspeaker. Its weight is substantial, too, tipping the scales at a staggering 61 pounds, no doubt where that inert quality stems from. The Gold can be finished in any of Triad's real-wood veneers or custom paint schemes, though the standard finish is a sort of matte black, which is great for home theater applications. Behind the Gold's curved Acoustimesh metal grille rest four drivers: two eight-and-a-half-inch metal cone woofers, a single five-and-a-half-inch coated paper cone midrange and one one-inch fabric dome tweeter. Again, all of the Gold's drivers are proprietary to Triad, though they are manufactured by SEAS. The Gold uses a fully braced, sealed enclosure, meaning it does not rely on porting to enhance bass response. The Gold has a reported frequency response of 50Hz to 20kHz, with a sensitivity of 92dB into four ohms (3.2 ohms minimum). Its relatively stable four-ohm load and high-ish sensitivity make the Gold suitable for a wide range of amplifiers, integrated and even AV receivers. The Gold in its in room configuration is designed to either rest on stands within a room or to be placed within a cabinet. Triad makes a matching pedestal stand for the Gold at an extra cost ($325 each), effectively turning it into a floor-standing speaker. Those of you looking to build a multi-channel setup around the Gold should also look at the matching center ($2,150), which is largely the same loudspeaker, with the tweeter and midrange slightly reconfigured for horizontal applications. Purists who like symmetry up front could just as easily employ another Gold LCR rather than the Gold center channel, if they so desire. Triad even offers the Gold LCR in an in-wall configuration. There is little to no performance difference between the Gold in-wall and in-room loudspeaker, a testament to a well-engineered product. The Triad Gold speaker system was not sent to my home for evaluation. In fact, it wasn't even offered to me. I stumbled upon the Gold system while visiting a friend and fellow home theater enthusiast's home a few weeks ago. I was so taken aback by what I heard that I decided to include it in Home Theater Review's feature review schedule. My friend's system resides in a dedicated room approximately 12 feet wide by 14 feet long. His theater is entirely light controlled and features a 110-inch Stewart film screen and a fully calibrated JVC D-ILA projector. The room has undergone a barrage of acoustical treatments, with diffusion at the first and second order reflection points and six inches of absorption everywhere else - well, minus the ceiling and floor, where it's only four inches. The theater is small but cozy and has a studio-like appearance and sonic quality once the music or movies start. My friend utilizes two Triad Gold LCRs for his left and right mains, each resting on a custom-built and reinforced acoustically dampened ledge, with a Gold center channel resting just below the edge of the screen. Side and rear channels are the less expensive Triad Bronze/4 LCR in-walls ($600 each), which proved to be a sufficient match for the Gold; the in-wall version of the Gold LCR would be an identical match. The speakers are powered using Parasound Halo amplifiers, with the processing duties falling to Marantz's AV7005 AV preamp. The source for both music and movies is the Dune HD Max media player, which is connected to my friend's home network and network-attached storage, allowing us to watch movies and/or listen to music at the touch of a button in full-quality picture and sound. As side note, anyone still hanging onto physical discs at this point should really look into such a media server-type setup, for once you've experienced its simplicity and immediacy, it's hard to go back to anything else. As for bass duties, the room itself features four passive subs, all from Boston Acoustics, arranged in a symmetrical configuration in each of the room's four corners. The subs are driven by a B&K receiver, where they are time-aligned before being fed to the Marantz for Audyssey EQ-ing. It sounds tricky (and it is), but the effect is nothing short of amazing. In any case, that's not what this review is about. Since the room was already configured and broken in, all I had to do was enjoy the show, and my, what a show it was. We kicked things off with some two-channel music by way of Mike Oldfield's Tubular Bells III (Warner Bros UK) and the opening track "The Source of Secrets." This track opens with gentle breeze sound effects, followed by various bells that move from left to right and front to back. The wispy sound of the coastal breeze was organic in its tonal quality, with copious amounts of air and nary a sign of glossiness or top-end harshness. I'm gaining new respect for fabric dome tweeters, and the one utilized in the Gold is among the best I've heard. Read more about the performance of the Gold LCR on Page 2.